​SCROLL DOWN - listen to Claire's success story. Comment or ask our guest a question. Listen to this episode or others on iTunes. Subscribe to the Acting Classes In Perth: Student Success Stories Podcast on iTunes. 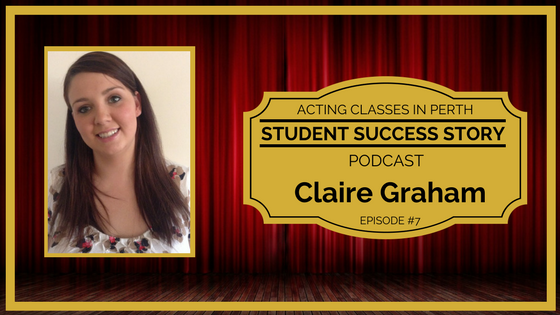 Review this episode of the Acting Classes In Perth: Student Success Stories Podcast on iTunes. ​Follow Acting Classes In Perth via our Facebook page. Reach out to us, and let us know if you (or someone you know) should be a guest on a future episode of the Acting Classes In Perth: Student Success Stories Podcast. For more information on the types of guests we want to interview on the podcast, have a read of this. Great acting headshots can make or break your career when you're starting out. That's why both Loren and Acting Classes In Perth trust only one photographer to help you book more auditions. $150 Discount off her 'Ultimate' Headshot Package. Simply use Promo-Code "SAVE150" when you book. Limited time offer. Use Promo-Code "SAVE150" when you book and get a $150 Discount off Kelly's 'Ultimate' Headshot Package. .